You spend a lot of time at your desk getting those assignments done — or skillfully avoiding them. That’s why it’s so important to personalize your workspace, so that it can also be your happy place. Whether you’re super feminine or just dig a minimalist look, here are five ways to style your dream desk so that you can have your most productive (and stylish!) semester yet. If you’re a free spirit with a serious case of wanderlust, a boring desk won’t do! You need a desk with lots of fun, eclectic accessories — with plenty of space for your anthropology textbooks. If the Free People catalog is your go-to-guide and you have a penchant for making flower crowns, this one’s for you. Mason jars: Fill them with paperclips, writing utensils and flowers for some extra boho flair. 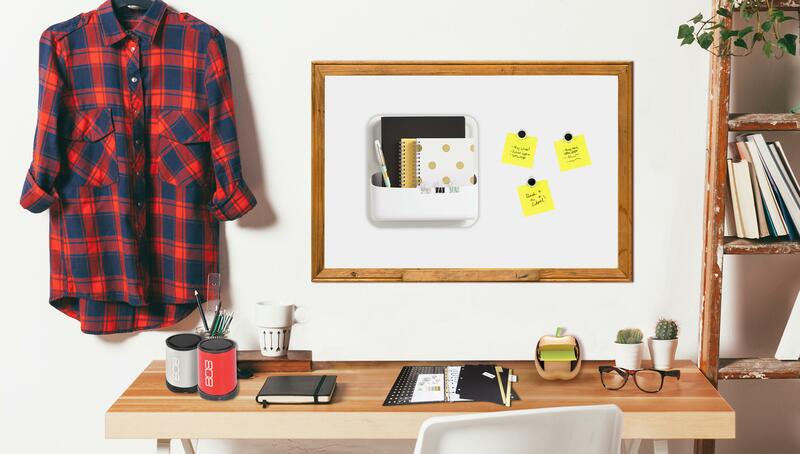 Perch: We love this magnetic wall-mounted container from Office Depot® OfficeMax® that will allow you to keep desk knick-knacks and supplies off your desk to save room. Wall art: Not everything on your wall has to be functional! You’ll study better in a beautiful space, we promise. Frame your favorite posters or get some thrift store paintings for a funky, vintage look. Bright containers: Keep all of your food and drinks in spill-free containers that looks as cute as they are practical—we love these Sistema® to-go containers from Office Depot® OfficeMax®. The bright colors will add a pop to your workspace. Calling all art school students! You do not do well in bland, colorless spaces — so make sure your desk is full of life. If you would rather be in the paint studio than math class, look no further. This desk is modern, innovative and totally hip — perfect for you. Magnetic board: You’re a big thinker so you like to see all of your ideas right in front of you. Make it easy with a giant white magnetic board over your desk. Add a few Perch magnetic wall containers at Office Depot and OfficeMax stores or online along with pictures and inspirational quotes! Contemporary art: Don’t even look at the Monet posters in your campus bookstore. You need something bold. We love these cool two-tone paintings that you can easily make yourself. Frame them and lean them against a wall for a casual vibe. Cute backpack: No matter if you’re an art history major or a creative writer, we know you’ve got a lot of stuff to lug around campus. Office Depot® OfficeMax® has the most fun polka-dot Jansportâ backpack for the perfect mix of functionality and style. Hey there, girly girl! If you love pink as much as we do, this is your dream desk. Colorful and filled with personality and charm, this desk will set the scene for your most productive nights. Why go to the school library when your own desk is so much cuter?! Vases: Stick a bunch all around your room while you’re at it. Pro-tip: While we love fresh flowers as much as anyone, fake ones are way more dorm-friendly and require less upkeep! Pink desk chair: Why not make your chair the focal point of your desk? We’re totally digging this pink Brenton Studioâ chair at Office Depot® OfficeMax® stores or online. Green rug: With a green, fuzzy rug that looks like grass, you’ll basically be having your own pink and green garden party while you work. Sign us up! You need the minimalist desk look if you’re super chic, crazy-organized, and love black and white. You’re probably on the Dean’s List every semester and you love clean spaces almost as much as you love your A-studded transcript. Make your semester your most productive yet with this sophisticated desk set-up. Highlighters: You basically invented color-coding. Highlight your heart away with genius clear-view Sharpieâ highlighters to keep your lines precise. Pick up a few today at Office Depot® OfficeMax® stores or online ! White accessories: Make your space clean and super chic with a white lamp, coffee mug and chair. Notebook: You’re going to need something like this Stellar Notebook with Spine Guard from Office Depot® OfficeMax®. It has a place for your class schedule, student ID and even comes with colorful page flags for even more color-coding! Sleek pens: Why use pencils when you can get sleek lines from pens like these? We love these TUL Fine Point gel pens that come in every color! Okay, so you’re kind of a hipster. From your extensive collection of plaid shirts to your black-rimmed glasses, you’re into the rustic vibe. Make your desk match your personality with this cool desk. Old school camera: Works great for your photography class and as a desktop accessory! Apple-shaped sticky note dispenser: We’re literally obsessed over this Post-itâ golden apple from Office Depot® OfficeMax®. Totally unexpected, but so much fun for your desk. Bold initial art: Make a statement with your first initial! We love it on the ladder next to the desk. Perch: We’re convinced everyone needs one of these magnetic wall mounts containers! Keep your spare glasses case in it along with more gold notebooks. Which desk is your favorite, collegiettes? 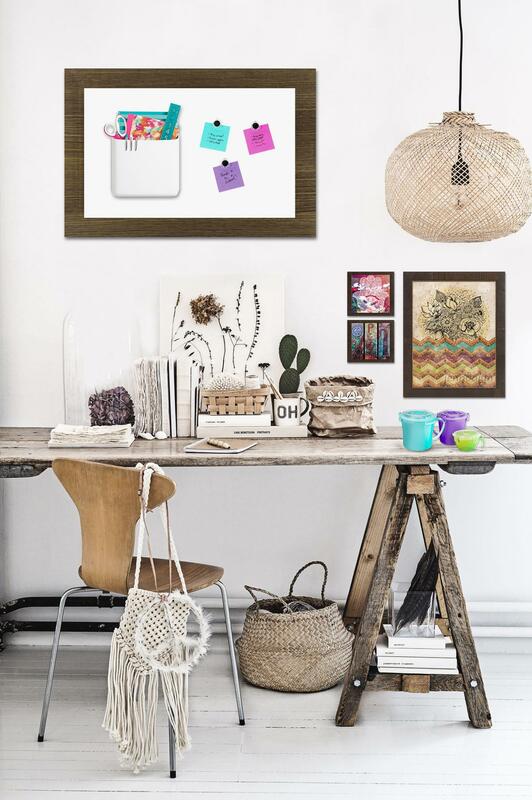 Use these tips to make your desk both functional, stylish and totally you!